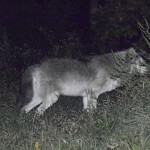 Two wolves from the center were released, then shot within months. The whole program has effectively been on hold for almost five years. Just last week the Fish and Wildlife Service announced it wouldn’t release any wolves this year — without any real explanation. while federal and state wildlife debate what to do. (The states involved, Arizona and New Mexico, seem to also be locked in a battle over who can be more inhospitable to wolves.) So far the program has released 92 wolves into the wild on the Arizona-New Mexico border. But since 2006, they’ve only released one–despite continued illegal hunting of the wolves. 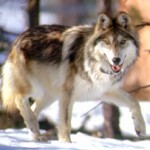 Since 1998, there have been 75 documented wolf deaths. People who presumably don’t like the federal intrusion of wolves introduced to cattle country shot 32 endangered Mexican gray wolves. Twelve were hit by cars. Only 10 were confirmed natural causes; the rest are under investigation. Wolf-watching expert Jean Ossorio camps a week to see one endangered Mexican gray wolf. Planned tours would work–if locals shot few of the endangered lobos. 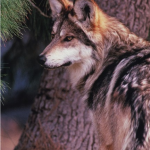 The Mexican Gray Wolf is down to maybe about 40 animals in the wild after yet another illegal shooting, but Defenders of Wildlife is starting a tour to try to see the animals with local Arizona tribes.